Occasionally, we receive letters such as the one below, with no return address or signature. This particular one is so full of misinformation and false statements, that we decided to share it and our reply here, in the hopes that the "anonymous" author, and anyone else who may have been misled, might see it and be educated. "My great great grandfather fought for the Confederacy and was killed at Petersburg." God bless him! What SCV Camp or UDC Chapter to you belong to? "Yours is a sad and puzzling effort. Let's get the fact straight. 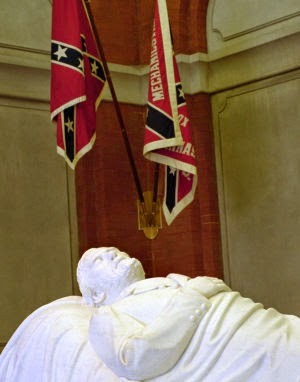 1) There were NO flags in the Chapel for 60 years after Lee died, and no evidence that Lee wanted flags there". We are not sure what facts you are "straightening" here. We have never heard anyone claim there were flags in the Chapel before 1930 and do not dispute that fact. You claim there is no evidence that Lee wanted flags there. We assert that there is also no evidence that Lee DID NOT want flags there, despite what the Chapel docents have been instructed to tell visitors. "2) The real flags were there for 60 years from 1930 until about 1990, NOT until 2014, as your brochure so incorrectly states." Actually, it was 1995 when the original flags were removed for preservation and restoration, as they certainly should have been, and reproductions were secured and put in their place, as they certainly should have been. Our brochure states that the reproduction flags were removed in July of 2014, which is correct. "3) They were removed over 20 years ago by the MOC because they were deteriorating. In their place, W&L got some commercial knock off/replica flags which have no more historical value than something I could buy in an Alabama K Mart." As stated before, we have no issue with the arrangement, made in 1993 between the University, the UDC, and the Museum formerly known as the Museum of the Confederacy, to restore and preserve the original flags. However, you, Sir or Madame, are greatly misinformed if you believe the replica flags that were carefully placed were something that one could purchase at a department store. As can be seen in the above photo, the flags were custom made to precisely replicate the unit flags that were removed for restoration. They were and are of great "significant historical value", and as the flags of several units who fought under General Lee, completely appropriate as displayed in the mausoleum. 4) W&L has removed these knock offs and is getting Real battle flags on loan from the MOC (now known as the American Civil War Museum). Yes, W&L has removed the replicas, but it has absolutely NOTHING to do with the plan to restore and preserve the original battle flags, which was a project started by former President Elrod, NOT President Ruscio. Removing the replica flags was NEVER a part of that project, and is completely unrelated. The flags were removed in capitulation to the demands of 6 W&L Law Students who threatened "Civil Disobedience" if the flags were not removed. University officials have used the (1993!) agreement as a smokescreen to cover for this fact, and, apparently there are those like you who have swallowed the spin... hook, line, and sinker. 4) Those flags WILL be available for viewing and education in the Lee Chapel Museum; anyone who wants to see them can see them. Bravo! We are happy to hear that the 1993 agreement and project is (apparently) coming to completion. The Virginia Flaggers will be the first in line to get a look at the flags if/when they appear in the museum. The conclusion of this project, however, had NOTHING TO DO WITH THE REMOVAL OF THE REPLICA FLAGS IN 2014. The removal was a capitulation to the demands and blackmail of 6 students who the university obviously failed in their duty to instruct in the character and honor of Robert E. Lee. These are the indisputable facts. On the contrary, your assertions have been clearly disputed above. How is it possible that The Flaggers think there is a crisis and that anyone other than you is or should be outraged? For starters, there are the thousands of letters, phone calls, and emails from outraged citizens, students, and alumni that the University has received since the blackmail letter was received in April. Anyone with Confederate blood in their veins who is NOT outraged by this desecration is not worthy of his/her heritage, in our humble opinion. You are accusing W&L of desecrating Lee's grave when his remains are on the floor below the room with his statue?! Yes, we are. The mausoleum above the grave is clearly intended as an extension of his final resting place. You are now calling Robert E. Lee IV out of line? Actually, what we said was we are disappointed that he would privately believe that removal of the flags was ok, and saddened that he would allow himself to be used by the University as a means to cover their deeds. We stand by both statements. His blood line is certainly one to be honored, but it is does not allow that he is free from criticism when it is due. People south and north are laughing at you. Oh...well in THAT case... (Sorry, couldn't hold back the sarcasm.) We do what we do because we believe it is right. No amount of scorn, especially from folks who have no clue what has happened, and no understanding of our heritage, will stop us. You are feeding those who think the old and new South if full of reactionary nuts. One man's "reactionary nut" is another man's Patriot, and I know on which side my ancestors and I stand on. Please devote your time to something logical and productive. You saw us and received and read a flier...sounds pretty productive to me. End your carnival act in Lexington. No. Believe it or not, there are those of us who refuse to be silenced by silly threats and PC hogwash. We will not go away quietly and act like nothing has happened. We will continue to do everything in our power to spread the truth of what has happened at W&L, and hold Ruscio and the administration responsible for their despicable act. Sunday, December 7th: Mechanicsville Christmas Parade. The Va Flaggers will join the Edmund Ruffin Fire-Eaters in this VERY Confederate friendly parade. ALL are welcome! Friday, January 16 - Saturday, January 17th, 2015: Lee-Jackson Day, Lexington, VA. We will be flagging Lexington and Washington & Lee all day Friday, and flagging and participating in the Lee-Jackson activities scheduled for Saturday, including memorial services for Lee and Jackson, and a parade through town. THIS YEAR NEEDS TO BE OUR BIGGEST SHOWING EVER! MAKE PLANS TO JOIN US... take a stand for Lee and Jackson in the town that has chosen to dishonor their memory and let them know that there are those of us who will not forget what City and W&L officials have done.